Ownership / Access: Lancaster Golf Club. Notes: Ashton Hall is a largely rebuilt 14th century mansion in the civil parish of Thurnham, Lancashire, England. It is 3 miles (4.8 km) south of the city of Lancaster and is on the east bank of the River Lune. 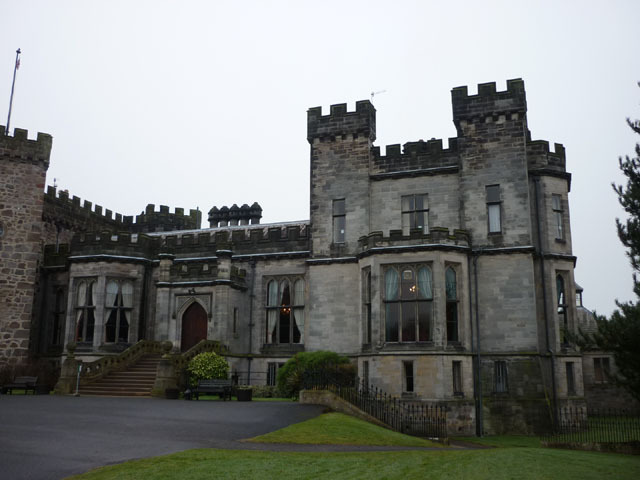 is recorded in the National Heritage List for England as a designated Grade I listed building, and is now owned by Lancaster Golf Club.In the 13th century, the lordship of the Manor was held by the De Coucy family and from them passed to John de Coupland. The original hall dates from the late 14th century. It was probably completed in 1381, built by Edmund Lawrence. It then passed by marriage to the Butlers of Radcliffe and from them to the Gerards of Bromley. In 1698 the estate was acquired by James Hamilton, 4th Duke of Hamilton, on his second marriage to the Gerard heiress Elizabeth Gerard. He fought a famous duel in 1712 with Lord Mohun over the right of ownership of Gawthorpe Hall and was fatally stabbed by General Macartney, Mohun's second. His widow lived for another 32 years, spending most of her time at the Hall. In 1853, the hall was sold by the Dukes of Hamilton to Le Gendre Nicholas Starkie of the wealthy Starkie family of Huntroyde Hall and in 1856 was largely rebuilt to a design by William Le Gendre Starkie. The only part of the 14th century structure that still remains is the tower that now forms the southern wing of the hall. After Le Gendre Starkie's death Ashton passed to his younger son, John Piers Chamberlain Starkie who passed it in turn to his eldest son Edward Arthur Le Gendre Starkie. He sold it in 1884 to James Williamson, the linoleum manufacturer, who lived at the hall until his death in 1930. Williamson was High Sheriff of Lancashire for 1885 and on his elevation to the peerage took his title Baron Ashton of Ashton. After his death in 1931 the major portion of the estate was purchased by William Pye and his sons. The land around Ashton Hall has been turned into a golf course, and the hall is now owned by Lancaster Golf Club.